Budget friendly adjustable bench Power supplies perfect for testing LED's and other uses! So, I am considering ordering the DPS 5015. I have never used AliExpress. Do you guys preload a card to use with them? If so, what kind of card does it take? They are secure enough that I just use my normal card. I mean aliexpress / alibaba is one of the largest companies in the world, I am gonna guess that they have halfway decent security. I did not buy one of these, however I have in the past been greatly disappointed with these type of supplies due to my overly exuberant expectations. Don’t expect to input 40V and have continuously variable output voltage from 0V to 32V AND be able to draw 12A along that whole range. I am guessing here, but I’m thinking that you could possibly get that 12A only IF the input voltage is no more than say 1.5 times the output voltage. Even that 12A might be an exaggeration. For me, this could be useful for some portable power. Mate this with an 18V drill pack, and you could do all kinds of neat things with it. I thought the same thing when I first ordered them but to date they have worked exactly as advertised. I have nothing that can use 30v @ 12 amps to test it with but on my smaller unit that is powered with a 12v power supply, it has no trouble providing the full 5A it is rated for up to 11v. It most certainly DOES provide 12 amps no problem at all (well besides the shunts and mosfet getting warm), I do it all the time when testing multi-emitter lights among other things. I have yet to have it not do what it should under any circumstances. What I’ saying is that if you input 30V you would not be able to get anywhere near 5A out. All I am saying is this is not a substitute for a variable bench type power supply that can provide the amps over it’s entire voltage range. I still do not have a decent bench top power supply. I am thinking about getting something like this to make a portable supply. You misunderstand, I have 2 units and both function exactly as they should. 1 with a 12V input and the other with a ~40v input. I have no problem getting whatever voltage and amperage I want no matter what the input voltage is (as long as it is over the output naturally). They actually make a GREAT substitute for a bench power supply and that is exactly what I am using them for. The only thing I have not been able to test is both high voltage and amperage as I have nothing that can pull that much power. Yeah, I can see how folks might interpret the operating ranges to mean that the product can operate in both extremes simultaneously. The product page does warn about it, but it isn’t stated in a clear manner. One has to know a bit how these budget buck circuits work to know that it stresses them to have too much voltage overhead on the supply side. You got to pay big bucks for what you are expecting. That is why mine will be powered by 1 to 4 DPS-600PD’s. That will enable it to be powered by 12, 24, 36, or 48 volts. Actually, much more choices will be available as they are being modded for variable voltage output. Or even smaller ones without the displays that can even be used in a roomy light build, but still have pots for both voltage and current limits (the latter of which could be replaced by a remote knob for analog power control of a light). I am not aware of any such warnings. Could you please quote them here. But maybe that doesn't cover the whole point. These seem like a great deal for what they're asking, no question. I paid several times the price of this setup for my 30V 10A linear supply. 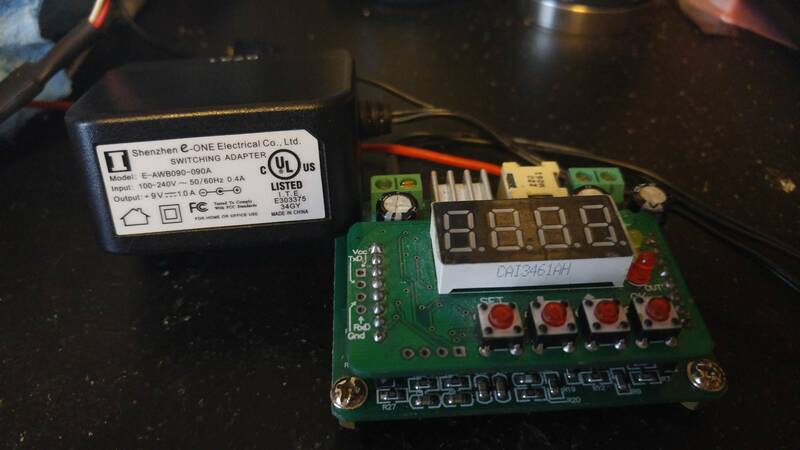 Be careful with the cheap power supplies for these---remember: the only thing keeping you from the mains is that power supply; this buck converter is not isolated. I wouldn't want to be touching probes or live equipment all the time that is powered by a questionable AC/DC power supply. Spring a few extra bucks and at least get a Meanwell or other mainstream (and hopefully listed) AC/DC supply to power this with. Depending on your needs, a laptop supply should be pretty reliable no? (maybe they don't handle abuse such as shorting well?) Often available for free. This is not true (at least for the 50V/15A DPS5015). I did some quick tests when mine arrived and it did not have any such limits. I tested it at 49V input with output voltages of 44, 36, 24, 12, 6, 3V and currents 15, 12, 8, 4, 2, 1, 0.5A (all 42 possible combinations of both) and it worked fine, with efficiency between 90-98% for nontrivial loads (over 20W). The efficiency measurements are probably +/-3% since I didn’t have time to set up more precise tests. So you are saying that you can input 49V and draw, say 6V, at 15A with this thing? If that is true, I am very, very surprised! I will have to consider the DPS5015. As some others mentioned, being able to go over 42V is a must for some of the higher power COB emitters. Yes, it was about 93% efficient at 6V/15A and about 87% efficient at 3V/15A. Ditto, as I said above, I use this to test basically all my flashlight builds before putting batteries in as it allows me to see exactly what is going on. It REGULARLY sees the full 12A it can deliver at ~4v. Sometimes for extended periods in order to test thermal regulation on the light. All of this with a ~38V input voltage. Besides getting a little warm it has shown no issues at all over the few months I have been using them. These seem like a great deal for what they’re asking, no question. I paid several times the price of this setup for my 30V 10A linear supply. Be careful with the cheap power supplies for these—-remember: the only thing keeping you from the mains is that power supply; this buck converter is not isolated. I wouldn’t want to be touching probes or live equipment all the time that is powered by a questionable AC/DC power supply. Spring a few extra bucks and at least get a Meanwell or other mainstream (and hopefully listed) AC/DC supply to power this with. Agreed, a better power supply is indeed a good idea. Something like the server power supplies that were posted earlier (or maybe in the review thread?) are ideal but also cost a lot more. I want to get a 5015 with one of those server power supplies but would have to sell the 3012 I have now to afford it, so kinda stuck at the moment lol. For basic hobby use a cheap power supply is a cheap way to get it up and running. The bang for the buck is what attracted me to these in the first place. I could not find anything close. I usually get my power supplies from the thrift store. It’s like $1 for whatever you find in the cord box. Good idea, although keep in mind that normal ATX power supplies are only 12V. 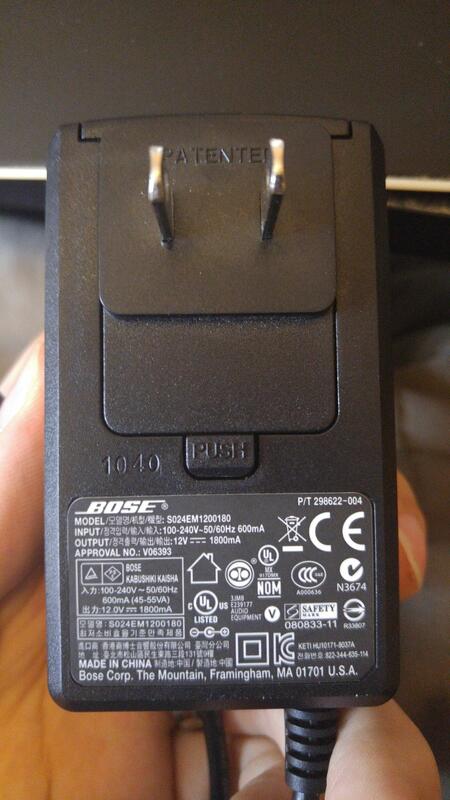 Laptop supplies are usually 15-20v but not a lot of wattage. These work fine, just keep in mind that these modules can only reduce voltage, not increase it. An original (not cheap clone) laptop power supply ought to do the trick. Some of the older laptops (and even some of the newer gaming laptops) have 200-300 watt supplies! Generally only around 18V-24V, but that is plenty for most flashlight stuff. EDIT: Maybe the above means, don’t power so close to 60v that fluctuations and surges in the power supply push voltage above 60 volts. It would be cool if the designer chimed in on this current discussion. That sounds reasonable (and consistent with my EDIT above). I’m even more stoked about this 5015 after hearing what you and TA have experienced. Thank you for reporting it. EDIT: I still plan on keeping the input voltage fairly close to output voltage, but it’s great to hear how hardy this unit seems to be. Yeah, I have been truly impressed with the quality of these units which is the only reason I posted about them in the first place. Heck when testing the voltage drop in my leads I did it by shorting them out and seeing what the voltage drop was at 10A. Did that for some time while trying to reduce it as much as possible and trying to figure out what the weak links were. 10A @ .5v was no problem at all even with 38V input. I really don’t need anything with much power; I only use a power supply to calibrate drivers, not test LEDs. But this thread got me in the “upgrade mood” anyways. This is what I had been using, a B3603 and a 9v, 1A power supply from an old LCD picture frame. It works ok, but I never liked how exposed it is or how thinly protected the power cord was. Which is actually a downgrade in that it is CV only, not CC, but for me that’s ok. 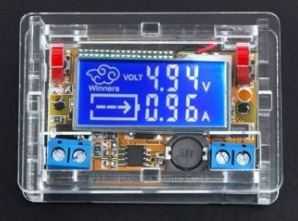 The nice thing is that it shows Current and Voltage simultaneously and has a nice acrylic shell. I’m pairing it with this 12v, 1.8A Bose psu I just got at Salvation army for $1. It’s a bump in power and an even bigger bump in quality. It has a single thick cord instead of the weak side-by-side glued-together cord on the old psu. 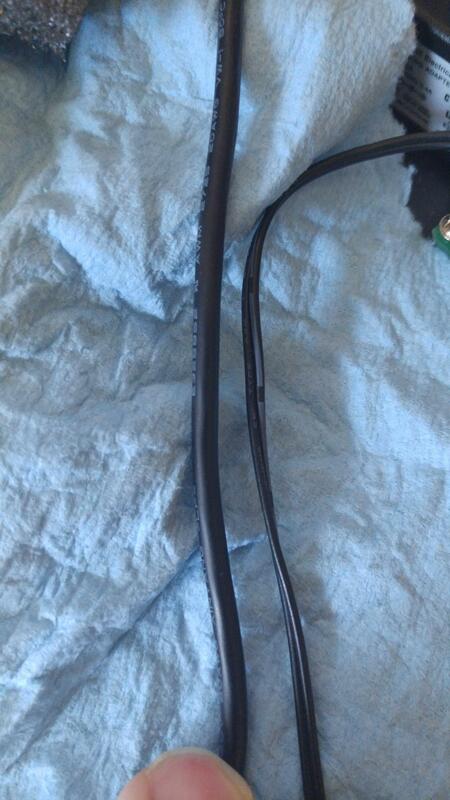 20awg vs 24awg and a lot more rubber. Thanks for the heads up, I just ordered a few including a DPS3005 which is a 5A all components inside the display. I have actually been looking at that same power supply for some time, It keeps popping up on banggood. Just could not think of a use for it. One thing to keep in mind is that the cheap supplies can have a lot of ripple voltage, this could effect calibration on drivers. So if you notice the calibration is not right, I would look into that. Hmm… Any good way to reduce that? Cap on the ouput? Yeah, a cap would most likely help but I am not sure on the details of it. Tossing a largish cap on the output would not hurt. You can pay more money for one that already comes (by the looks to me anyway) with bigger capacitors and inductors, but if you want LCD too, you're quickly headed toward thinking about the ones in the OP. I'd either be looking at the $10 with no display or go all the way for the 5015. I'll probably do both. You can pay more money for one that already comes (by the looks to me anyway) with bigger capacitors and inductors, but if you want LCD too, you’re quickly headed toward thinking about the ones in the OP. I’d either be looking at the $10 with no display or go all the way for the 5015. I’ll probably do both. Yep, this is the same thing I ran into in my review thread posted in the OP. I had an analog version to start with and to make it truly useable would have costs more then just buying one of the DPS models, so hence I tried the DP series and never looked back. That is one thing I forgot to mention, the larger 3012 and 5015 allow you to charge batteries without a diode, which is much much better (it allows you to see the actual voltage of the batteries instead of just what the supply is putting out plus the diodes have a voltage drop as we know. "If you connect the supply power with output, the module will be burnt"
10A not 12. 30V not 50, no reviews, probably doesn't charge batteries, but the cost isn't really much more since it includes a supply, and it's all packaged up. My biggest issue with it is TA hasn't tested and reviewed it. So that makes the DPS5015 the winner. 10A not 12. 30V not 50, no reviews, probably doesn’t charge batteries, but the cost isn’t really much more since it includes a supply, and it’s all packaged up. My biggest issue with it is TA hasn’t tested and reviewed it. So that makes the DPS5015 the winner. I am thinking that is a copy and paste error or like you said, it is saying to not connect a high voltage line to the output. I have charged up to 24v packs with it without an issue so far. That other unit is nice but for $110 you can get 2 of these if you wanted. Even if you got a very nice power supply you should still be able to buy a few flashlights with the leftover money. Although if you want a premade unit with no DIY work needed, then it is not a bad unit based on specs alone.